Having survived a couple of heat waves and looking forward to the longest holiday weekend ahead, we’re already giving our sunscreens a good workout. Hawaii has recently taken the bold step of banning chemical sunscreens which has called attention to the dangerous affects of mainstream sun protection. In our humble opinions, this is long overdue and we hope other agencies follow suit. (Hello FDA, we're talkin' to you! 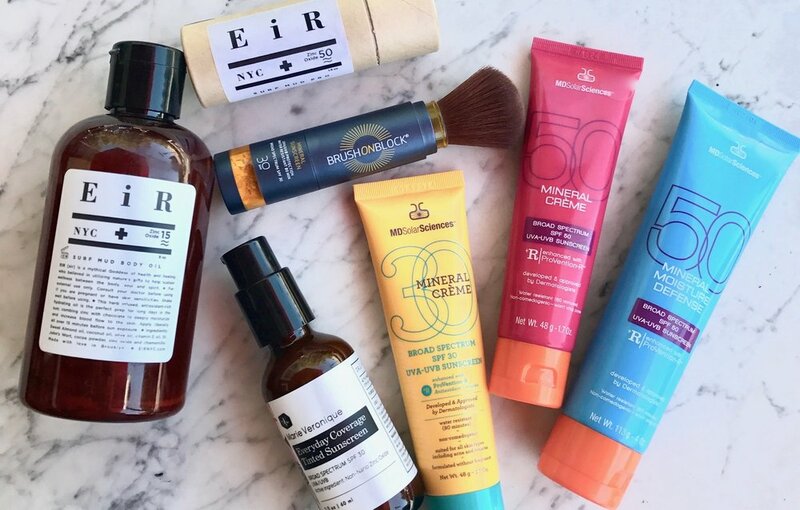 ), Here's our quick breakdown on the dangers of conventional sunscreens and the best clean sunscreens we’re crushing on right now. Conventional chemical sunscreens work by absorbing the sun’s harmful UVA and UVB rays. If that weren’t terrifying enough, they also typically contain endocrine disruptors, nano-particles that are harmful if inhaled, and toxic fillers and preservatives. Not only are these nasty concoctions not proven to prevent melanoma, but they decimate sea life as well. Mineral sunscreen is the way forward. They act as a physical block meaning they reflect rays rather than absorbing them. The next best thing to clothes, zinc oxide is the gold standard of sunblock, however the struggle with zinc oxide in the past has been application; it often goes on quite white and thick. Titanium dioxide is also considered safe and is often blended with zinc oxide for better texture. Here is a roundup of our favorite mineral sunscreens that are revolutionizing application and wearability. Available now at Siren Apothecary! Everyday Coverage Tinted Sunscreen by Marie Veronique (Light/Medium, $48): This non-nano zinc oxide formula is a miracle and Environmental Working Group agrees- rating it #1 in it’s sunscreen guide since 2014. Designed to be applied over a face oil (such as Marie Veronique Protective Day Oil) this SPF 30 glides on as a super lightweight veil of sheer color that for most can pass as a light coverage makeup. The formula feels weightless and utilizes mica to maintain a fresh demi-matte finish; it's unlike any other zinc oxide formula on the market. EiR NYC Surf Mud Body Oil ($35): For those that love an oil for the body, you can now rest assured that you are actually getting sun protection. This SPF 15 uses zinc oxide suspended in a sweet almond, coconut and olive oil blend. Chocolate provides an antioxidant boost (and yummy scent) and chamomile soothes. EiR NYC Surf Mud Pro ($30) Packaged in a handy compostable stick, this high level of sun protection is ideal for quick application, touch ups, and spot treating areas that perhaps were missed or got too much sun the day before. Like the Surf Mud Oil, this SPF 50 stick utilizes zinc oxide in coconut oil, cocoa butter, cocoa powder and beeswax. MD Solarsciences (Mineral Creme SPF 30/50 for face $30; Mineral Moisture Defense SPF 50 for body $39): This is our absolute favorite sheer sunscreen for the face and body. Zinc oxide and titanium dioxide are the actives, blended magically to create an emulsion that goes on like silk. This makes a great matte foundation primer for those that need higher coverage makeup on the face. The body formula is quick and easy to apply. Brushon Block: ($32/$17 refill) This is an awesome way to deliver sunscreen to areas that you don’t want to get greasy… The hairline and part, around the ears and neck, and maybe even the top of hubby’s head. Zinc oxide and titanium dioxide in powder form in a convenient brush applicator, it’s also a great way to apply to the little ones that can’t sit still or tend to put up a big fight. Don’t toss that brush when the block is done- save on waste- you can purchase a refill!